A group of about 30 Island residents and health care professionals identified mental illness, substance abuse, elderly health care and tick-borne diseases as the most pressing concerns for the Island population, at a public forum designed to identify community health care issues, Tuesday night at the Howes House in West Tisbury. Last Saturday morning, May 15, H.
Members of Tisbury's Tashmoo Management (TMC) and Harbor Management (HMC) committees met Tuesday and prepared a set of draft regulations that would allow a commercial fuel dealer to fuel commercial vessels at the Lake Street dock at Tashmoo. As a difficult school year — one marked by significant financial challenges and sputtering negotiations with five union bargaining units representing school employees — comes to an end, superintendent of schools James Weiss recently received an encouraging pat on the back. Lighting repairs will be done on the Bourne Bridge on Tuesday, May 25, from 8:30 am to 3 pm, according to officials from the U. West Tisbury police are investigating the theft of cash from Heather Gardens Nursery on State Road in West Tisbury, sometime late Saturday night or early Sunday morning. There is not the data one would need to conclude that the drug problem here is more severe today than it has historically been. Several Harley riders gathered at the P-A Club in Oak Bluffs on Saturday before heading out on a scavenger hunt in memory of John Gibson, who died in March after a motorcycle accident in Florida. "Times are financially tough for all of us, but that doesn't give anyone license to steal from others, least of all the good, hardworking, and gentle owners of Heather Gardens. Edward Duart, 61, died Sunday, May 16, 2010 at his home in Carver. The New England Scholastic Press Association (NESPA) awarded its Highest Achievement Award in Scholastic Editing and Publishing to student journalists from the Vineyard. Oak Bluffs Police will begin enforcing parking time limits on Circuit Avenue and roads in the surrounding area on Monday. Heather Jardin's friends — some 200 strong — turned out at the Portuguese-American Club on Friday night to help out Heather, 29, who is battling leukemia for the second time. To the Editor:There were public comments about the spending of the Oak Bluffs community preservation committee at the Oak Bluffs annual town meeting that I would like to clarify. Been fishin' yet? It is a common question on the Vineyard in early May, if people suspect you are a member of the Island's large fishing fraternity. Two candidates for the position of assistant principal at Martha's Vineyard Regional High School (MVRHS) will face final interviews next week. After 40 years of service to the Island community, Tom Bennett was perhaps the brightest luminary Monday night at the Martha's Vineyard Community Services' (MVCS) often-emotional event recognizing the work of staff, volunteers, and board members. 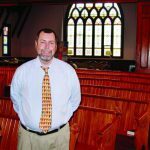 The Reverend Roger Spinney, pastor of the Baptist churches in Vineyard Haven and Aquinnah for the past 14 years, will move to Falmouth at the end of the month and take up new responsibilities as chaplain with Hospice of the Cape & Islands. Benjamin Seth Rosenbaum, 26, of Portsmouth, N.